Perfect for the condiment lover in your life, this awesome gift set is sure to please. 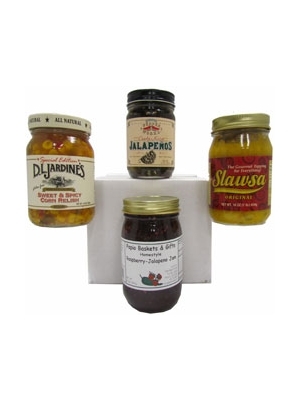 You select from some of our best selling, most popular condiments to include in this gift set. Send four different items or four of the same thing - you get to decide! Simply select which items you want to include (the final price will adjust as you change selections), enter your free personalized greeting and click 'Add to Cart'. Choose from the items listed for the first salsa to be included in the gift box. Choose from the items listed for the second salsa to be included in the gift box. Choose from the items listed for the third salsa to be included in the gift box. If you would like us to include a personalized gift message, enter it here. Leave blank if you do not wish to include a gift message.